Well, we can’t even get to the anniversary of the first shot that opened the Battle of Gettysburg before a controversy has already swept through the blogosphere and Civil War history community. 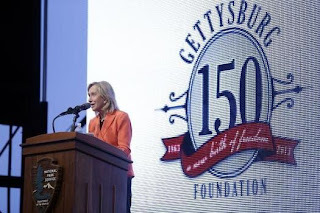 Doris Kearns Goodwin, author of Team of Rivals: The Political Genius of Abraham Lincoln (the inspiration for Steven Spielberg’s Lincoln) gave a keynote address last evening to kick off the commemoration of the Battle of Gettysburg and, according to most accounts, regaled the crowd with touching tales of how she met her husband and all the fun she used to have working for LBJ. Conspicuously absent? The Battle of Gettysburg and the men who fought it. What listeners did get was a long-winded excursion into everything from women’s rights to the modern gay rights movement, interspersed with more wistful and self-promoting stories driving home the point that she’s pretty much one of the coolest people ever. One recurring theme in some of the angst-ridden comments was Goodwin's well-known plagiarism scandal (for the fullest treatment of this epic scandal and others like it, see Past Imperfect: Facts, Fictions, Fraud - American History from Bancroft and Parkmanto Ambrose, Bellesiles, Ellis, and Goodwin by Peter Charles Hoffer.) I'd say that this is fair game, and why people still turn to her as a reliable source for understanding the American past is beyond me. Mrs. Goodwin committed acts that would get any graduate student kicked out of their program and would get any run-of-the mill historian blacklisted for life. But, instead of being drummed out of camp, Goodwin has gone virtually consequence free and can still charge “$40,001 & up” for her speaking engagements...perhaps in an effort to recoup the money she lost when she paid off the people she plagiarized from. All of this is to say that, with Goodwin, you know what you’re getting. She is what she is, and I’m OK with that (I thought Team of Rivals was a great book and, so far at least, it looks like it’s actually her work.) If the good folks up in Gettysburg truly thought that she was going to launch into an eloquent tribute to the men who fought and died at Gettysburg without taking some hard-to-follow detours, then the fault lies with them. If you’re looking for someone to blame, how about the folks who chose her to speak in the first place? Exactly. As I listened to the speech, I wondered when she would get to the larger, relevant point, but then I realized that kind of thing isn't in her. A recycled after-dinner speech is much more her style. Compare this to the case of Dr. Thomas P. Lowry and the pursuant rush to judgment with the Lincoln document that he allegedly altered, and you will see the chasm that differentiates the “cool kids” like Goodwin from the unwashed masses. Should he be let off because DKG was? If guilty, absolutely not.He has a different version of events than the one put forth by NARA. She just paid those she wronged and moved on, retaining her platform. Lowry, not so much. I was there, it was painful. Sad to say, the Gettysburg Foundation put her on. It is the private sector partner of the Parks Service. I am a member of the Friends at Gettysburg (largest Friends organization in the country) and we adopted the Foundation several years ago. It has been a rocky relationship as the Friends is all about preservation while the Foundation has a more political bent. So the article is correct, it should not have been a surprise.